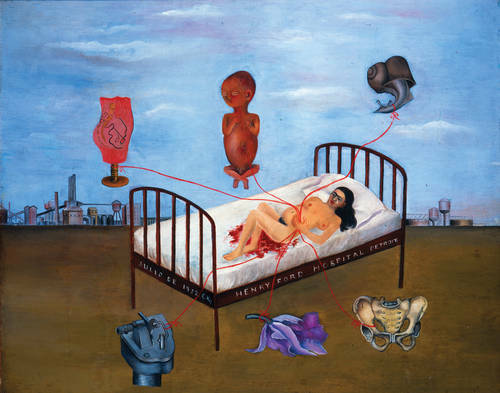 The Henry Ford Hospital done by Frida Kahlo was painted in 1932 with oil on metal. 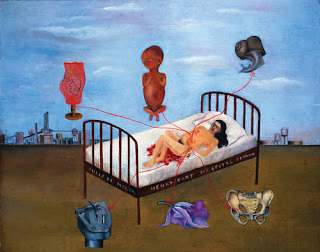 The picture depicts Frida's second miscarriage in the Henry Ford Hospital. The background shows the Ford factories of Detroit, a city which Frida hated. There are six objects coming from her lower abdomen connected by her umbilical cord. there is a baby, a snail, a piece of medical machinery, an orchid, a broken pelvis, and the female anatomy. the baby represents the child Frida will not be able to conceive due to her previous injuries from the bus accident. the snail was meant to represent her slow agony at realizing she will never be able to have a child. The orchid was a gift from Diego, her husband, while she was at the hospital. the piece of medical machinery represented the cold, impersonal hospital staff she encountered. and the broken pelvis and female anatomy are thought to be pointing towards her back which was also broken in the bus accident. I think that the combination of the hospital and the Detroit sky line really emphasis Frida's pain of being in a city sh doesn't like and away from Mexico especially during such a time of sadness. The painting is very powerful and really expresses her feelings.